Manufactured homes have captured the attention of many people looking to escape the high cost of renting or buying a traditional home. 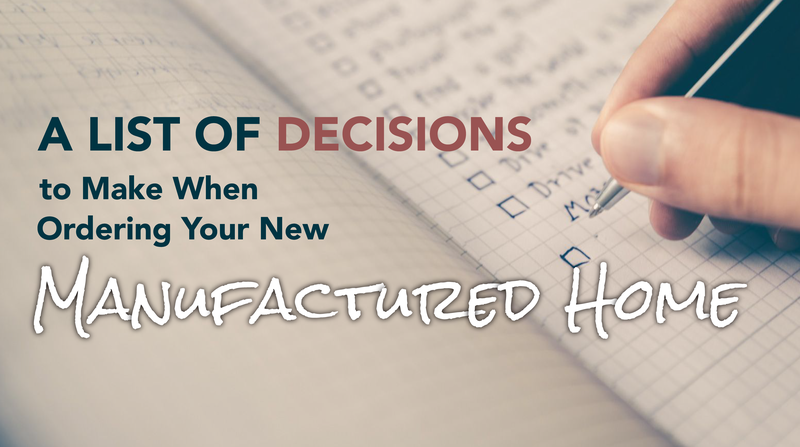 Although purchasing a new manufactured home is easier than it was a few years ago, every homebuyer should consider a few important factors before ordering such a home. To help, we’ve gathered below the most important decisions you need to make in order to get the home you want, when you want it. Before ordering a manufactured home, you need to rent or buy a piece of land on which to install it. While renting a lot in a land-lease community requires a lower initial investment, make sure that you check the community fees, the utilities and amenities available, as well as any requirements and restrictions that may apply to manufactured home installation. Buying a piece of land, on the other hand, requires extensive research into zoning regulations and may cost more upfront. On the bright side, you could use land as collateral for a manufactured home loan, which may translate into a lower interest rate and monthly payment. You can also purchase a new manufactured home along with land and roll everything together into a manufactured home loan with land. Whether you already own a piece of land, or you intend to rent or buy a lot, it’s important to prepare your site for the installation and setup of your manufactured home before ordering it. A chattel loan – This type of loan can be used to finance the purchase of a manufactured home that isn’t permanently affixed to land. In this case, the home is considered personal property. A conventional mortgage – A homebuyer can opt for this financing option when the manufactured home has a permanent, HUD-approved foundation and is classified as real property. Applying for a manufactured home loan is something you should do before you start looking for a home. Besides indicating the maximum loan amount you can borrow, getting approved for a manufactured home loan can help you determine how much home you can actually afford. Knowing what manufactured homes are in your price range can save you the hassle of looking at homes you cannot afford to purchase. To establish if you qualify for a manufactured home loan, most lenders will check your credit score, employment history and DTI ratio, among other things. At Triad Financial Services, we also use an advanced calculation formula to make sure that each potential borrower finds a manufactured home loan that fits his or her particular financial situation. Depending on the size of the lot you intend to put your home on, you can select a single-, double- or a larger, multi-section manufactured home. Although most manufacturers provide a few standard floor plans for manufactured homes, they can design different floor plan variations that could meet specific needs and requirements. A wide selection of exterior architectural styles and siding materials are also available to ensure full compliance with zoning regulations and building codes. If you intend to purchase a new manufactured home, the best place to start your search is the Internet, where you can find many dealers, retailers, manufacturers and installers. In general, dealers are the best options because they can connect buyers with lenders specializing in manufactured home loans. This means that you can gain access to a number of manufactured home loan programs, such as home only loans, land and home packages, and loans that allow buyers to use land as collateral. Finding a manufactured home dealer isn’t difficult. However, it’s very important to purchase your home from a licensed professional and enlist the services of a licensed contractor to complete the installation process. Faulty installation could cause a whole host of problems, including structural deterioration, accelerated depreciation and even unsafe living conditions. If you use unlicensed professionals, you may not be eligible to make warranty claims for defects in material or workmanship of the home. When buying a new manufactured home, delivery to the site may be included in the price of the home if the site is within a certain distance. Some dealers may calculate and charge the cost of delivery operations separately, or may leave the delivery process open to the manufactured home buyer. It is best to ask this question when purchasing your home. If you’re ready to make your homeownership dream a reality, a manufactured home may be the way to go. With a little research and planning, you could move into your new home in no time.